trong>Giveaway Details: Below this blurb of text, you’ll be able to follow a link (acessed by clicking relevant, magic-themed image below), which should take you directly to a separate page, where you will be prompted to accomplishing different activities to earn entries for this contest. The prize is of course an enviable one, for it consists of a complimentary hardcover edition of The Magician’s Land, being reviewed on August, 5, 2014 at midnight Eastern time. Contest Ends August 11, 2014!!! Now, click either the Harry Potter related GIF image below, or the GIF image of the fierce so-called “evil queen” Regina, from Once Upon a Time, to be taken to the Rafflecopter AP, relevant to this contest!! Writing a review of such a layered book feels like painstakingly peeling away the layers of a metaphorical onion; each layer represents a different strand of this veritably compex read. I do not even know where to begin with this book, because by the book’s satisfying, emotionally-wrenching book, my mind was positively abuzz with many different percolating thoughts, loose impressions, and other wild, inarticulate theories about just what this book represents not just within a trilogy of sorts, but the wider genre realm of fantasy. Lev Grossman has done something extremely rare, for the fantasy genre, (and yes, this is bound to sound presumptive), but he has clearly expanded the scope of the fictional potential of the fantasy genre. This book is once again a delightful pastiche of classical fantasy tropes, amalgamated with some very fun, twentieth-first century pseudoscience, with some light touches of cutting-edge theoretical particle physics as well. Rather than just have magic self-evidently exist,having fantasy features or paragonical figures bestowed with impossible inhuman features merely exist, Lev Grossman grants his book a certain degree of post-modern skepticism.Taking a cue from the modernist writers who were too overwhelmed by the paradigm shifts going on in our view of the world, he tries to field some type of tentative, somewhat feasible answers for the many questions about our existence, about the deeper, mysterious realm of subatomic particles, and other newly discovered layers to our world all within the template of a post-modern story, about a hero, who is neither a hero in the classical sense, nor in the predictable sense. 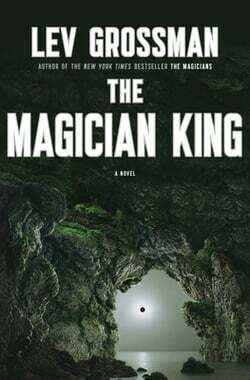 If you thought The Magicians was an ironical piece of writing, with some rough-edges of course, The Magician King is a massive improvement on the first book, cutting off any superfluous narrative fluff that obstructed the flow of an otherwise intensely interesting story, which finally treats the fictional notion magic in a way a very ardent, scientific way, studying the connotations and role it plays within this fantasy world, and its psychological connection with the fairly complex psychological personalities of our characters. In The Magicians, the characters often were still muddled in some elements of feeling more like caricatures, rather than characters, as if resembling the forced ironical nature of the story, trying hard to feel like a classic fantasy story with all the predictive elements of the Joseph Campbell hero story. By the novel’s end and throughout the beginning of The Magician King, these two forces- the polaristic forces of the known world of classical fantasy and the new world of twentieth-century pastiche fantasy (with hints of magical realism)- continue to be one of many layers to this story’s many rich, underlying layers of different elements that the clockwork, storytelling genius of Lev Grossman’s writer’s mind was able to seamlessly put together for this tale with an enviable degree of authorial control (something, I can learn from, for my own multiverse book). The characters really start, in The Magician’s King, to develop deep, paradoxical psychological personalities, epitomizing the deeper characters of twentieth-century post-modern fantasy novels, and defying the more circumscribed, hackneyed, symbolic characters of older series like the Lord of the Rings trilogy, or even the Narnia series. Questioning the self-evident is an important facet to this entire series, and the whole Magicians trilogy, is analogously Lev Grossman’s creative laboratory, where he is putting these various classical fantasy tropes to the test, by putting them up against our modern theories of particle physics, Einstein’s theory of relativity, and all the newest, revolutionary approaches to modern psychology. In many ways, both The Magicians and The Magician’s King have that Anne Rice proclivity to really fashion very engrossing, pastiche-ridden fantasy stories, which do not merely recycle older tropes, but plumb the logical and symbolic depths of these things, in ways that trenchantly offers new insights into how they would theoretically function in a world, which realistically mirrors the paradoxical, subjectivity-dependant world of the twentieth-first century. One central underpinning to this series, explored more in-depth in The Magician’s King is How can we still have stable psychological personalities, in the twentieth first century, when all the conventional societal rules and restrictions, are being called into question? In the post-modern world, we know some people have batten down the mental hatches into their psyches, and have effectively cloistered themselves, in a world where they can “magically” make the bygone, moribund conventions and orthodoxies of the past seem unquestionably true. And, some of the characters in Lev Grossman’s series do abide by this phenomenon of those that are uncomfortable with paradox, and thus abide closely by the laws that are engineered surrounding magic, even though the more insatiable seekers of knowledge, like our quintessential “hero” character Quentin, are always doggedly, trying to seek answers to the meaning of existence and their lives. He is the newest postmodern iteration of the classical tragic hero, of Hamlet, questioning fortune, fate, death and life. But, he goes beyond these questions, and begins to explore the deeper terrain of magic-a seemingly impetuous, absurdist notion- in a world that is not purely logical, as once believed. Many of the orthodoxies of the past, the constructs of classical fantasy tales, are ironically absurdist things in this novel, because they begin to lose their glamour and lustrous quality, and become to seem more illusory, to the mind of the post-modern thinker, who sees the world, as terrifyingly unpredictable, and the character is either forced to then find some enclave of orthodoxy, that blocks out the wider world of paradox, and finally offer some psychological security of sorts. Or, they must continue through life, always on the precipice of madness like a more Don Quixote class of hero characters (strangely post-modern, in an anachronistic sense). This is not the world of Shakespeare’s The Tempest, where magic happens to inexplicably exist, and all the events of the universe are predetermined towards finding a semblance of stability, by the play’s end, through the chaotic, intermeshed web of magical forces and the confusing panoply of different human choices. The Magician’s King is only about stability, being found with a more superficial understanding of the world, for characters like Quentin, who have the the illness of “modern malaise” are more like Lestat from Anne Rice’s Vampire Chronicles series, never truly satisfied with any feeling sense of certitude and equanimity, when making shallow peace with what the world has accorded, them in the way of power and consciousness. Magically, Quentin’s character continues to become more interesting, and other characters, who only had fleeting appearances like Julia (Quentin’s childhood friend), have much more larger roles in this series. Julia’s chapters, chronicling her more unorthodox discovery of magic and purpose in life, are some of Lev Grossman’s best writing in this book, as Julia is not just a strong female character, but a very interesting, dynamical character, who is far more interesting, in my eyes, than Alice, whom I found to be a bit stale, predictable, as though holding our hero Quentin back, in many ways, from really further discovering the deeper implications of the unpredictable events that transpire in his life. Julia works as a more liberalizing force, for Quentin, and perhaps, this is all purposeful, because Alice may have only ostensibly represented the love interest, in a more linear frame of a life, where Quentin accepts what fate allocates to him in his life, without question. But Quentin, being the postmodern hero character, defies not just an antagonistic force, but all the orthodoxies and logical underpinnings of his life itself, for the postmodern hero is a more evolved, enlightenment figure of one, who vigorously questions everything about life, regardless of the consequences. Beyond just overpowering my brain with so many philosophical, psychological, and magic mechanical geekery, there is a very rich emotional core too. I rarely cry, when reading books, but there were some moments that I honestly had to pull the book away from myself, as I let the tears fall, and tried to regain some sense of composure all before sinking back into the tale. This novel goes directly to the heart of the post-modern psychological dilemma,that very few books rarely delve into with such creative mastery. It is an emotional and psychologically honest novel, and Quentin disenchantment with the world around him, his impotence, and his incessant feelings that his magical abilities are a huge waste, are all things that I think can greatly resonate with my generation, the generation that grew up with Harry Potter, and believed in the possibility that the adult world would be as magical and meaningful, as the halcyon American Dreams showed them to be. I felt that all my hard work, in college, would somehow equal a roadway to satisfaction, when really it just equaled trying not to fall into a state of useless obsolescence, from the loss of the intellectual grounding and security that college offered. For Quentin, this grounding is the pretensive features of his Fillory throne, the fleeting intimations of the beauty of Venice and England, and a real desperate need to believe that heroic quests always end with rapture and gratification of some kind. For many of us, when we walked off the dais, after college graduation, there was a sinking feeling of futility and despondency, that was hard to shake, and to see a fantasy novel mirror this same psychological phenomenon in a dizzying world of a multiverse and magic felt very, very realistic and psychologically honest to me. There was not just contrived happiness and satisfaction being derived, by the pre-determined end of the hero’s journey, or graduation from magic school, but Quentin’s modern malaise-felt by other characters at times- is something I think is a resonant struggle and very real feelings, for anyone that reads this story. More than anything, it is Lev Grossman’s knack for being cerebral, with the mechanics of the magic system, while maintaining the human depth of his characters that really separates this tale from some other fantasy novels. After forlornly flipping the last page of The Magician King, my mind is still percolating with tons of different ideas about the deeper layers of this story, and it is such an intelligent read that it might always defy my attempts to not just rationalize things in the story, but try to contrive control, through my analytical mind, over the deeper meaning of this story. Rather than just be a bridge novel, between the first and last book of the series, The Magician’s King is a very unique fantasy novel, going beyond the stale exposition of other fantasy novels, and transcending the glacial pace of seemingly endless battle sequences. The Magician’s King is the indie film cousin, to the Narnia and Lord of the Ring series, probing the purpose and logical implications of the events that just happen and occur in a self-evidently, predictable, conscripted fashion in these films. This is a fantasy novel, for those who love Rubik cubes,more than action figures, for this wonderful, literary fantasy novel is really a very fascinating, enriching, puzzling conundrum of a novel, and I can feel my tired, though energetic brain yearning for the final piece of thie puzzle in the form of the next, forthcoming installment The Magician’s Land. I will be posting my comprehensive review of Lev Grossman’s The Magician’s Land at midnight (eastern time), August 5th!! There will be no spoilers in the review, making it safe for fans of this series to read!! Previous Post Review of “Sisters of Treason,” by Elizabeth Fremantle/ Giveaway! !